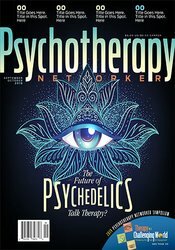 This issue looks at the growing research on the clinical benefits and risks of psychedelic-assisted psychotherapy. Articles explore the results of clinical trials with treatment-resistant PTSD, end-of-life anxiety, and chronic addition; what interventions using psychedelics look like; what challenges and dangers therapists should be aware of should FDA approval go through. Interviews with clinicians who’ve witnessed the effects of these drugs firsthand speak to how they might change our field and expand healing beyond the narrow medical model. Other pieces cover how to address clients’ end-of-session “bombshells” with confidence, how to use playful interventions even when trauma is a factor, how therapists can help people suffering from chronic pain, and an interview with an expert on treating mood disorders and suicidality. Describe Gitlin’s view of addressing “doorknob moments” to advance therapy with clients. Articulate the current research about the applications and risks of MDMA-assisted therapy. Explain Lender’s use of attachment-based games to improve client engagement. Lauren Dockett is Senior Writer for Psychotherapy Networker. Richard Simon, Ph.D. is a clinical psychologist and for the last 40+ years has been the editor of Psychotherapy Networker, the most topical, timely and widely read publication in the psychotherapy field. As editor, he has received every major magazine industry honor, including the National Magazine Award. Gabor Maté, is a renowned speaker, and bestselling author. Dr. Gabor Maté is highly sought after for his expertise on a range of topics including addiction, stress and childhood development. As an author, Dr. Maté has written several bestselling books including the award-winning In the Realm of Hungry Ghosts: Close Encounters with Addiction; When the Body Says No; The Cost of Hidden Stress; and Scattered Minds: A New Look at the Origins and Healing of Attention Deficit Disorder, and co-authored Hold on to Your Kids. An adjunct professor in the Faculty of Simon Fraser University, Dr. Maté has received the Hubert Evans Prize for Literacy Non-Fiction; an Outstanding Alumnus Award from Simon Fraser University, and the 2012 Martin Luther King Humanitarian Award from Mothers Against Teen Violence. Howard Schubiner, MD, is an internist at Providence Hospital and a professor at Michigan State University. He’s the author of Unlearn Your Pain, Unlearn Your Anxiety and Depression, and coauthor of Hidden From View.